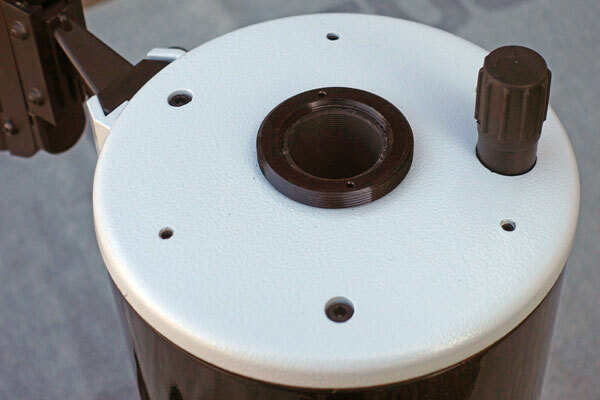 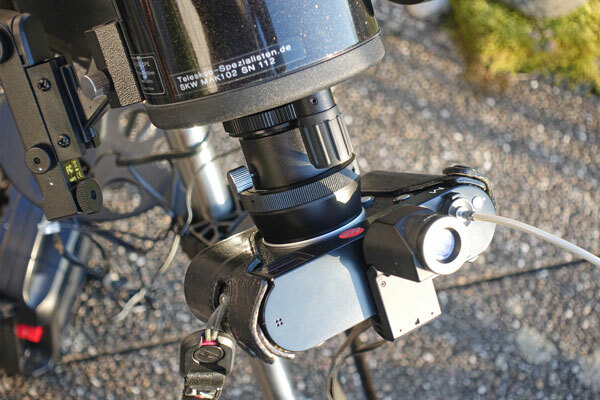 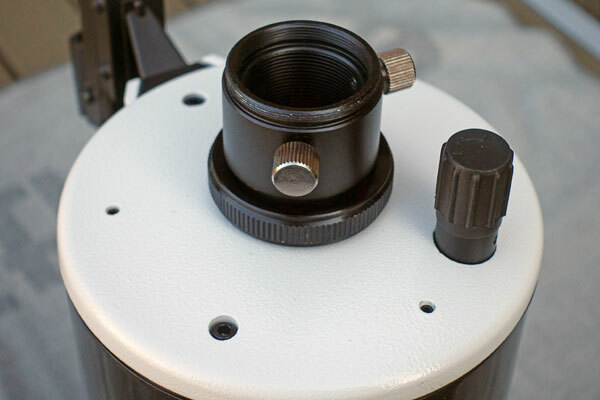 On this page, I demonstrate how to mount a Leica M (Typ 240) directly to a telescope with a T-mount adapter in order to take astrophotos. 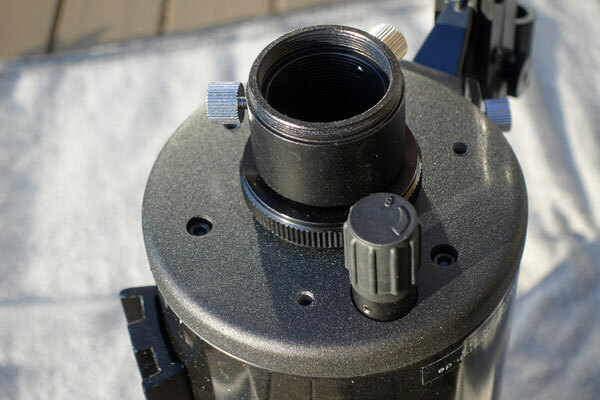 This connection option is available for my two Maksutov-Cassegrain OTAs, the Skywatcher Skymax-102 and the Skymax-127. 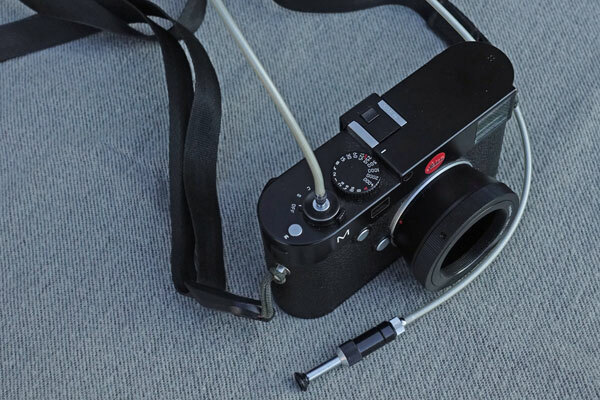 Only a camera with interchangeable lenses, such as the Leica M, can be mounted directly to a telescope. 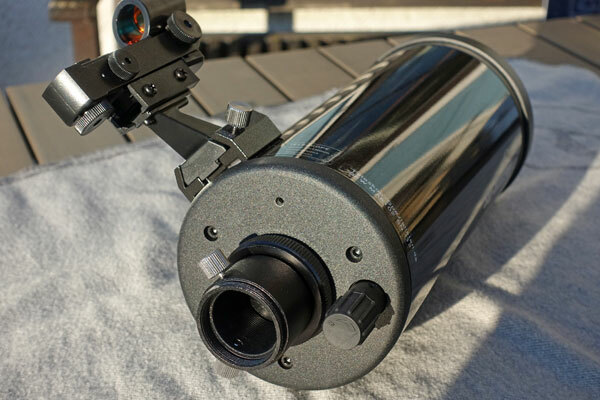 That is, the camera body is directly attached to the telescope tube, typically using a T-mount adapter, and the telescope serves as "camera lens." 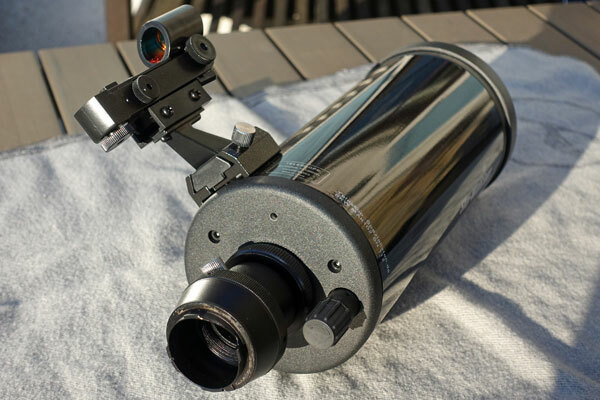 In the case of my Sky-Watcher Skymax-127 (Maksutov-Cassegrain) with a focal length of 1500 mm, the telescope tube is therefore a lens with a focal length of exactly 1500 mm and an aperture of f/11.8. In the case of the Skymax-102, a focal length of 1300 mm and an aperture of f/12.7 results. 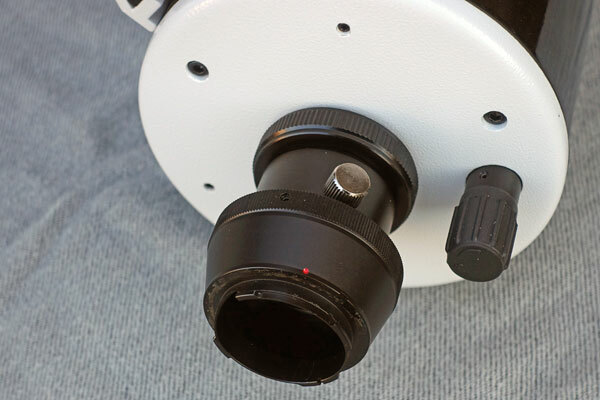 The Skymax-127 and the smaller Skymax-102 have an eyepiece adapter with T-mount thread at the eyepiece end. 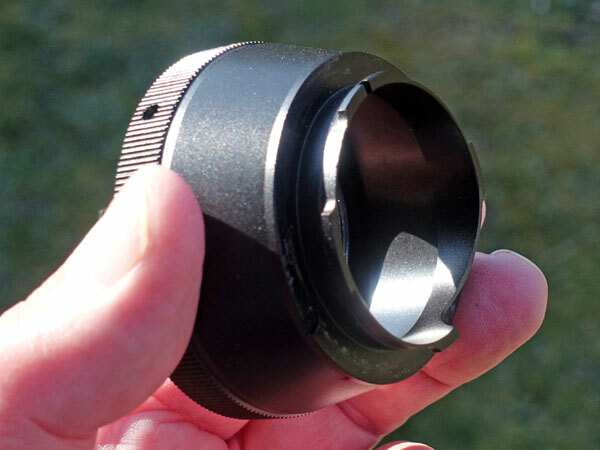 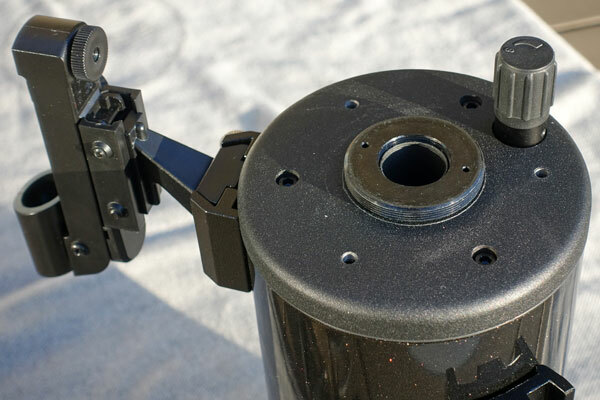 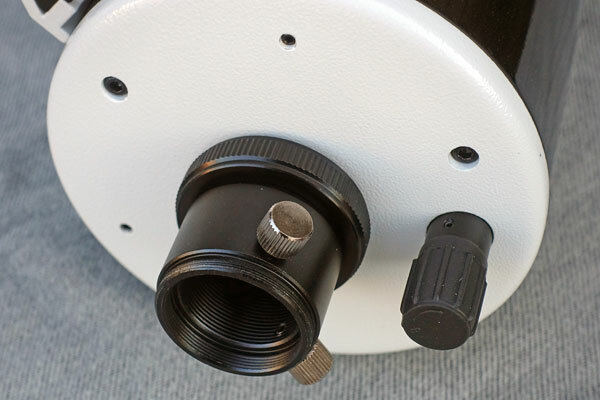 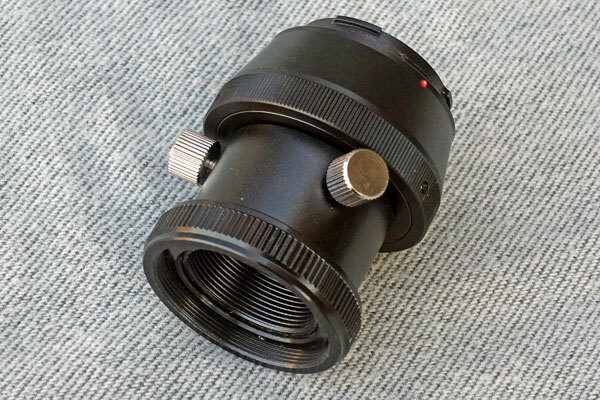 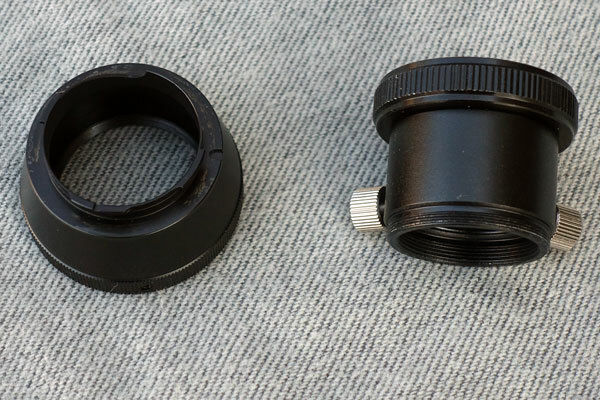 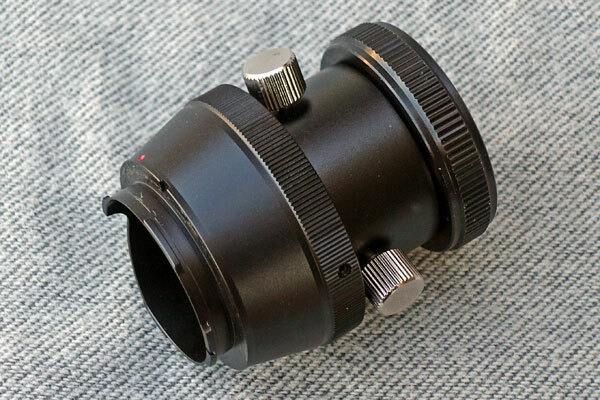 At the other end, there is a union nut that connects the eyepiece adapter to the telescope and also allows the eyepiece adapter to be rotated so that the fastening screws for the eyepiece (or the zenith mirror/amici prism) can be optimally aligned. 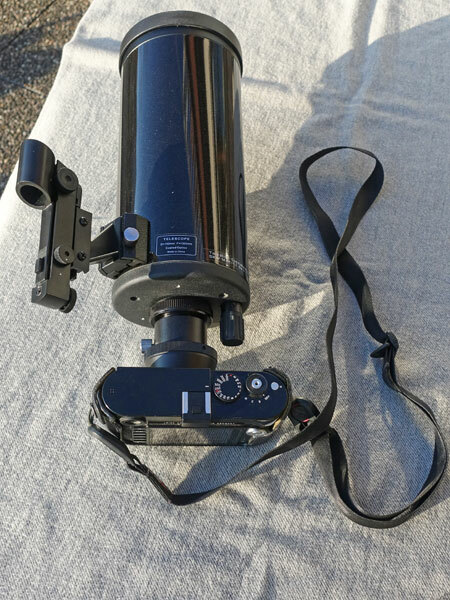 See the photos below for details. 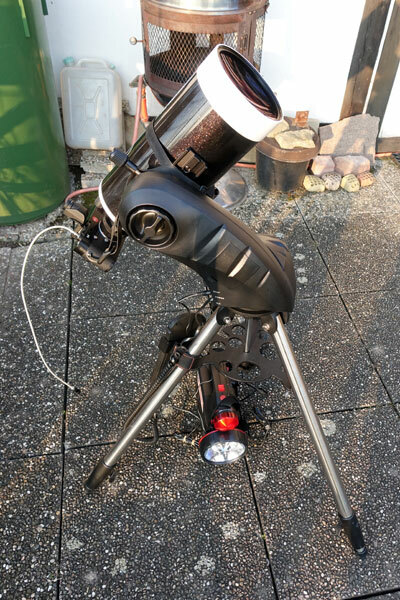 I reattached the inner ring to the adapter using the grub screws, but I was not able to tighten the set screws properly, because the Allen key did not fit exactly and spun. 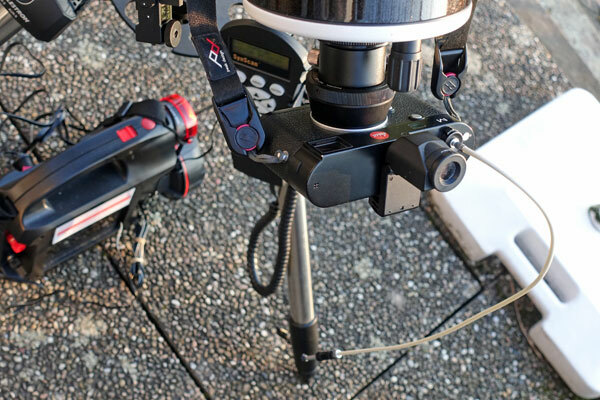 Here I demonstrate how to connect the camera to the Skymax-127 using the eyepiece adapter and a T-mount adapter for Leica M (the camera is not shown, you can see this below). 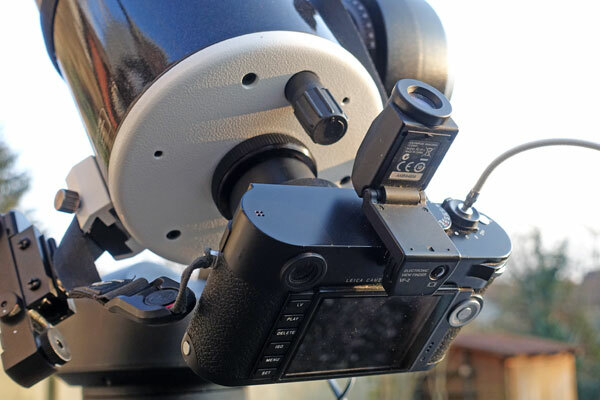 Here I demonstrate how to connect the camera to the Skymax-102 using the eyepiece adapter and a T-mount adapter for Leica M (the camera is not shown, you can see this below). 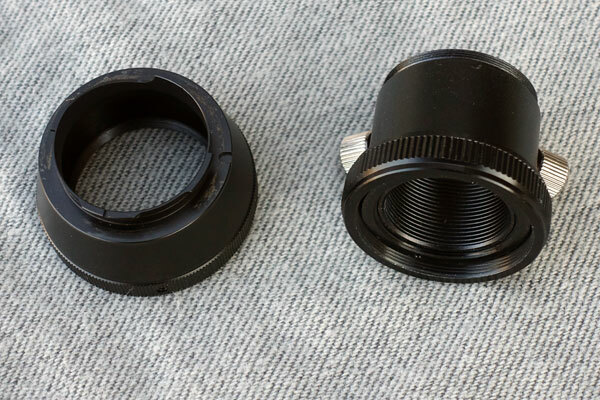 Here, I present the two adapters - individually and screwed together. 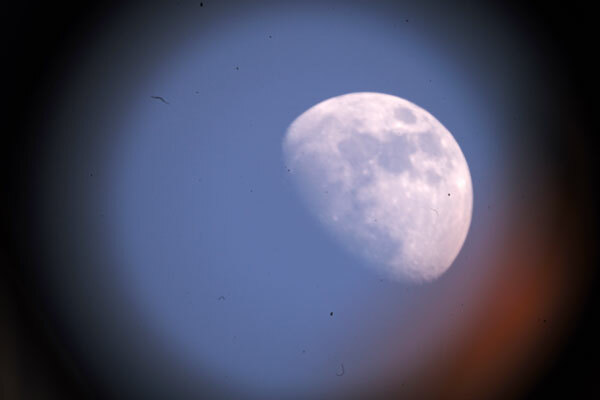 First, I did some daylight tests after "setting up the technology." 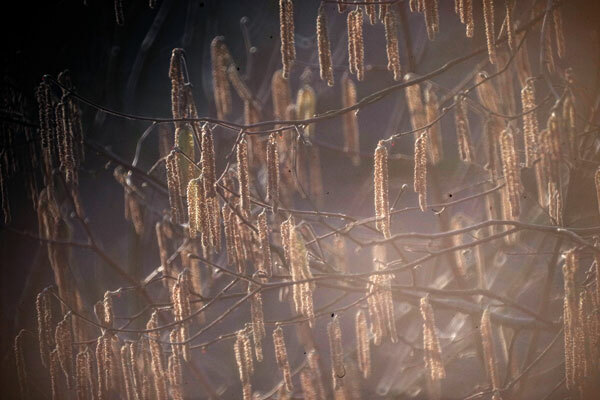 I was not able to focus daylight shots well - with the exception of a nearby subject (Hazelnut kittens, right column). 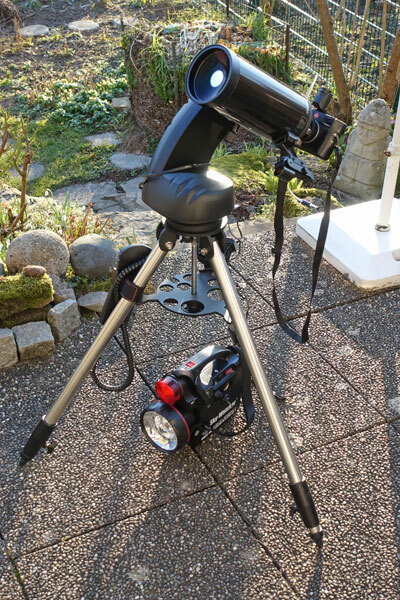 However, I had not used viewfinder magnification here. 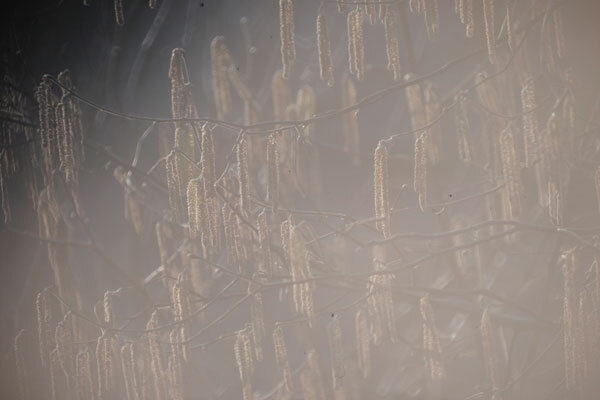 Motives against the light, unfortunately I did not have other motifs at my disposal, turned out having low contrast. 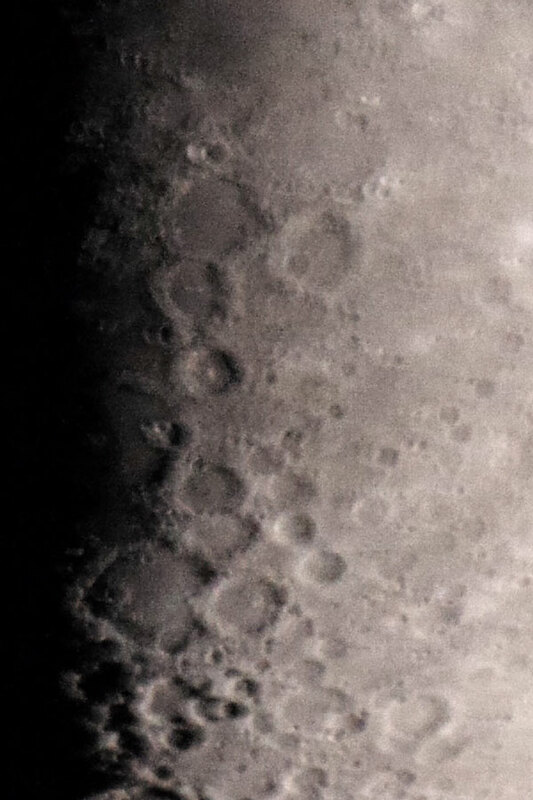 Since I had used ISO 1600, there was also a lot of noise in the photos. 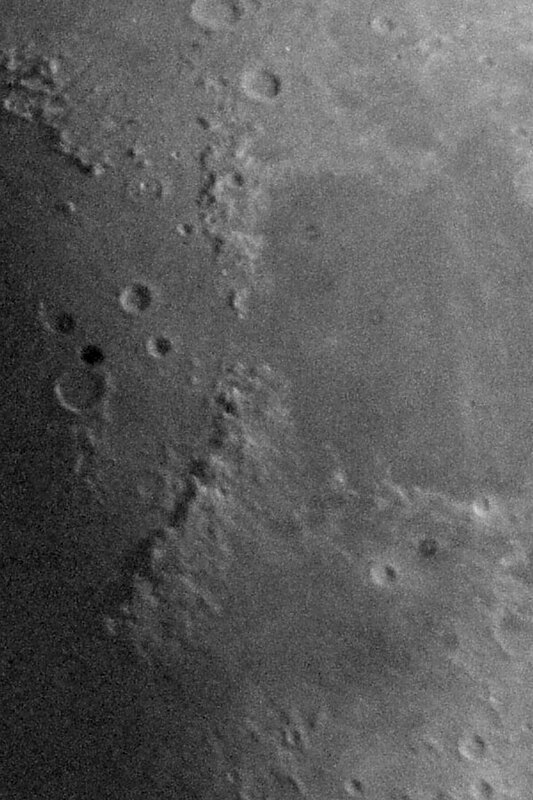 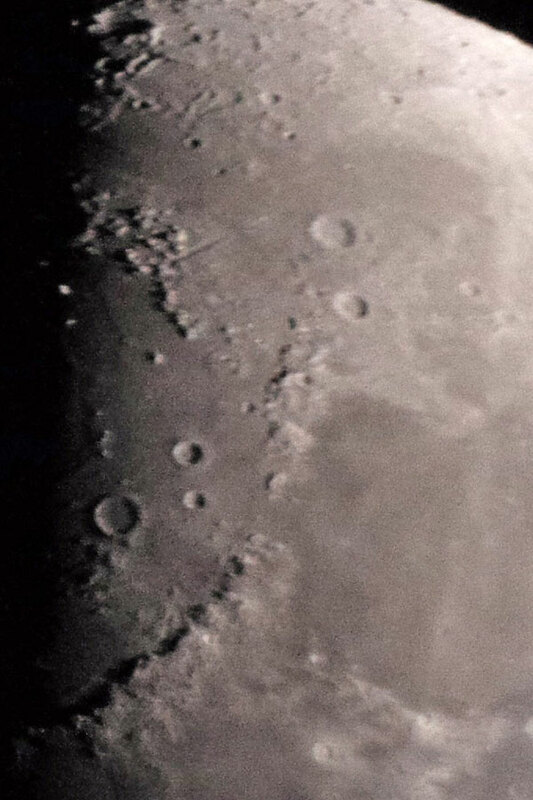 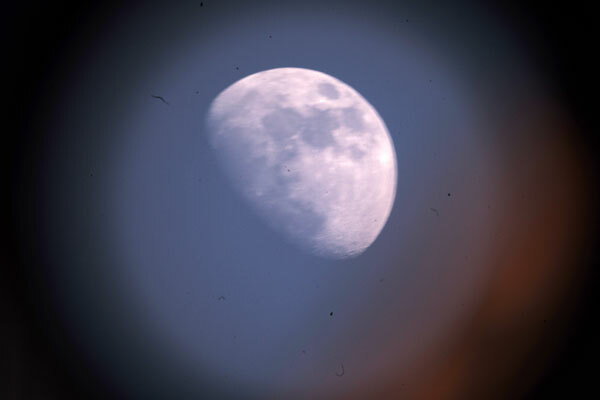 All in all, these attempts did not make much hope for my upcoming photos of the moon... 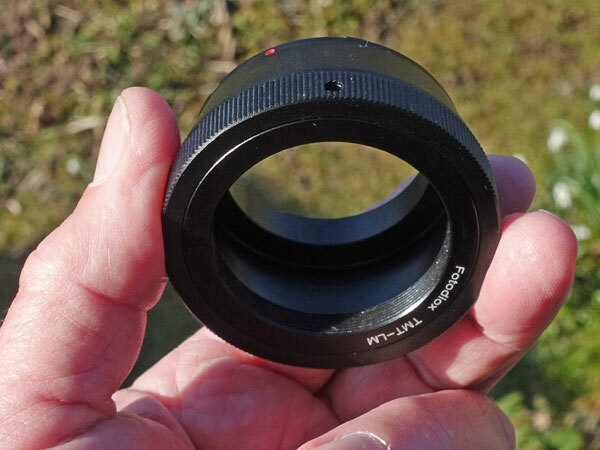 It also showed that the Skymax-102 produced much more vignetting than the Skymax-127, but it, too, cannot compete with typical lenses for photography. 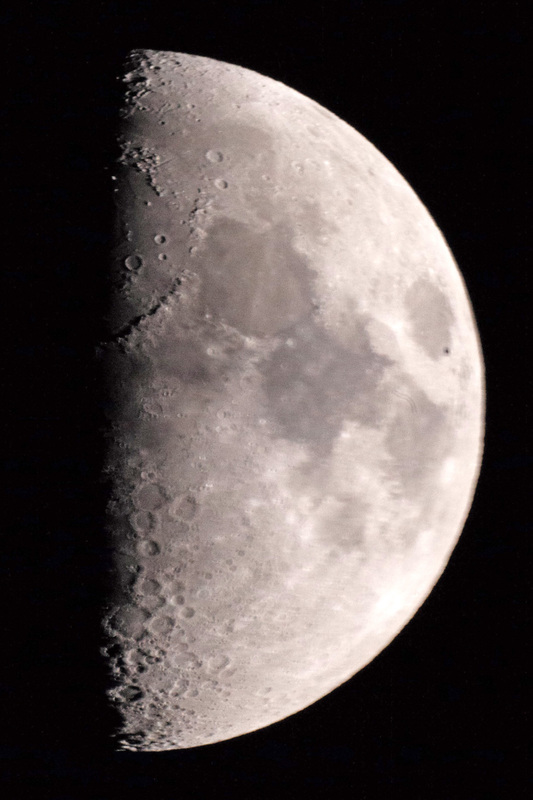 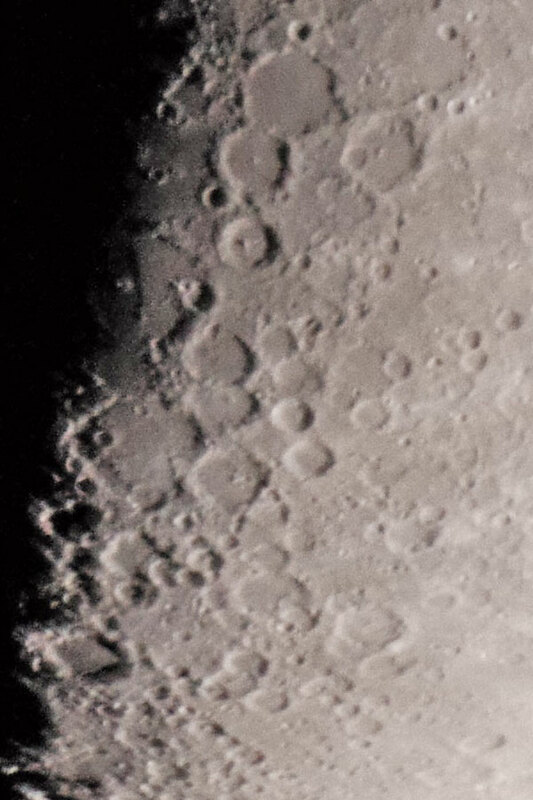 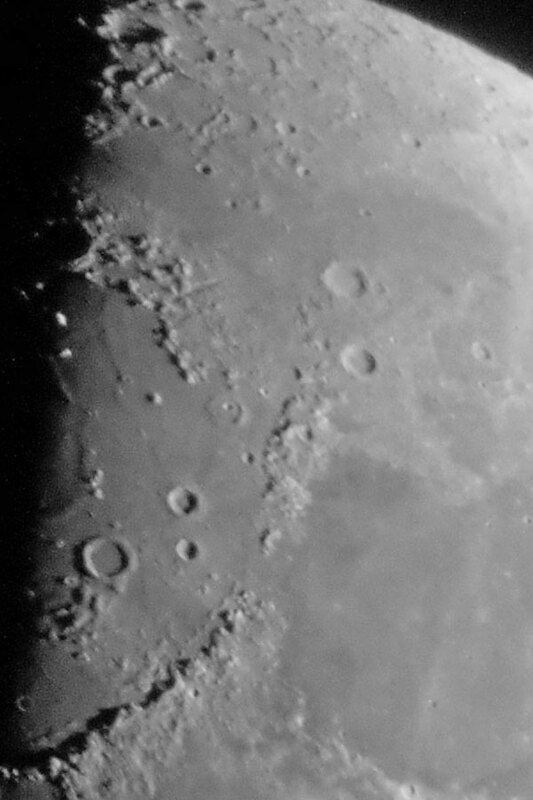 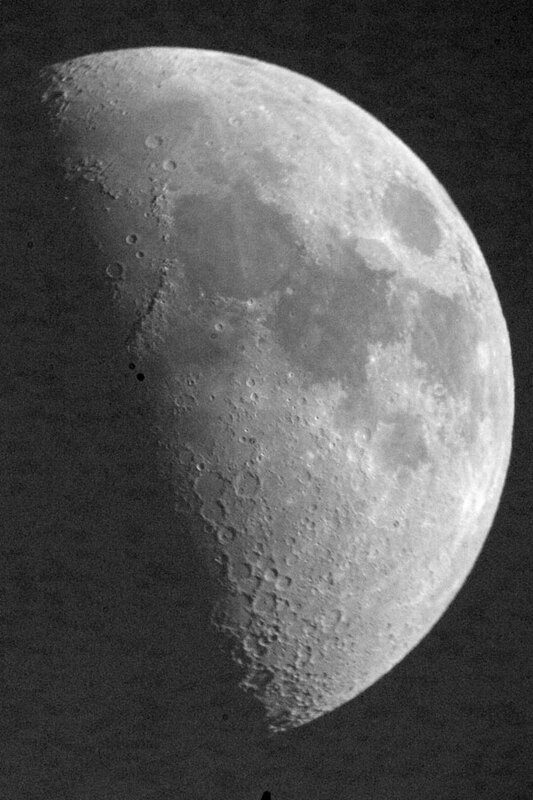 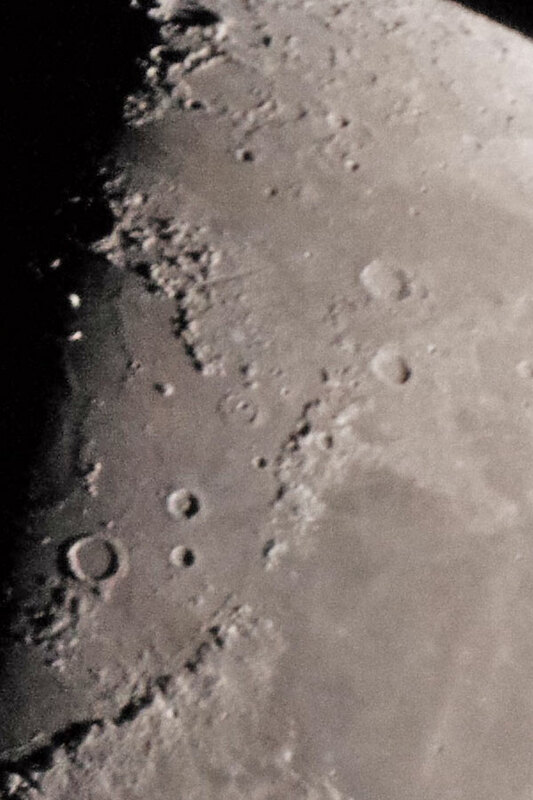 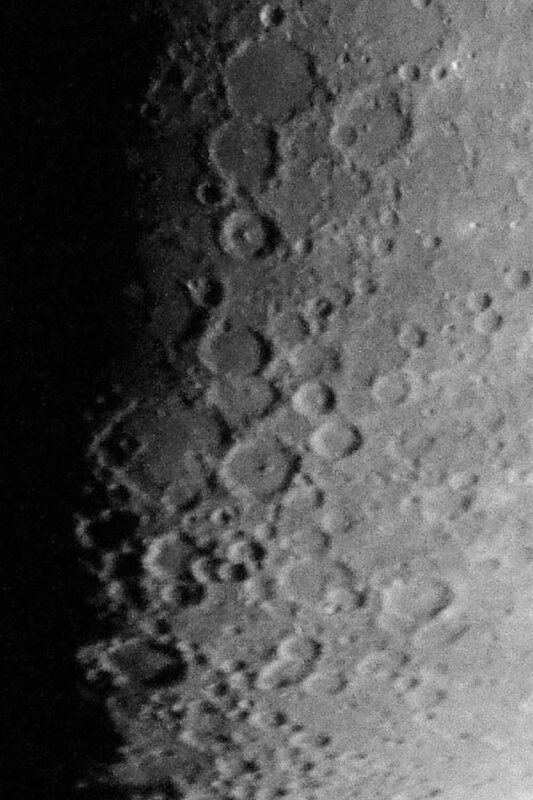 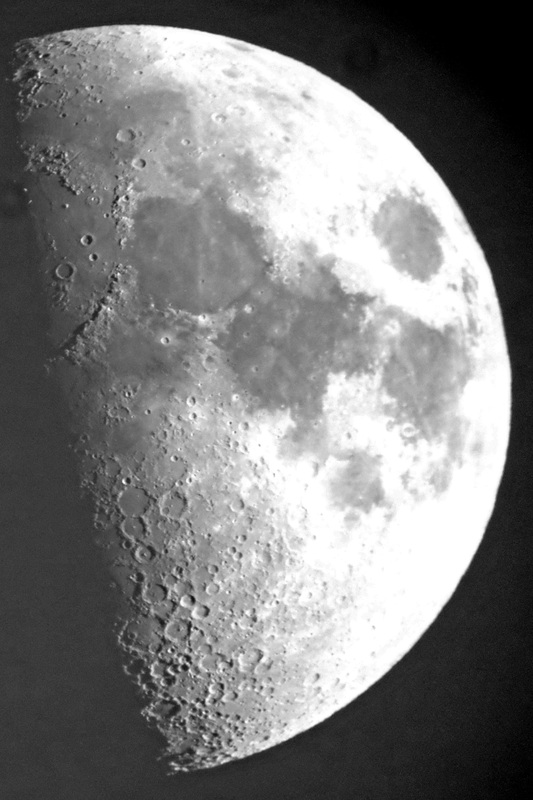 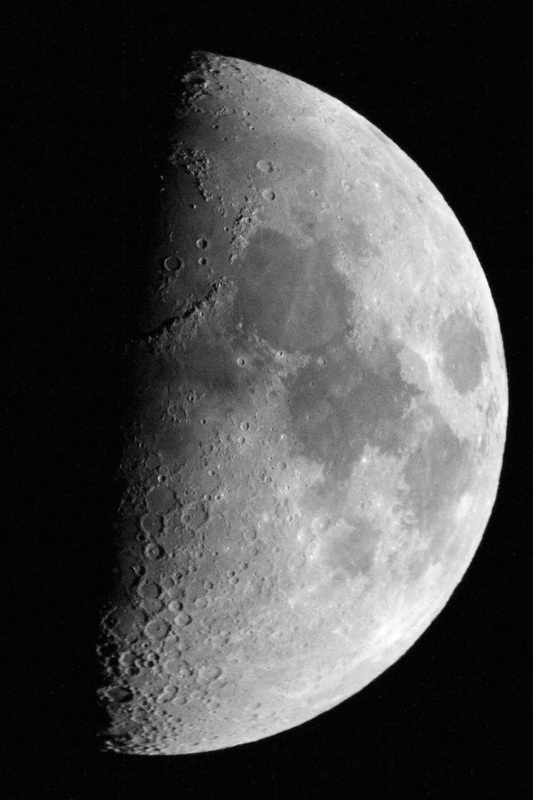 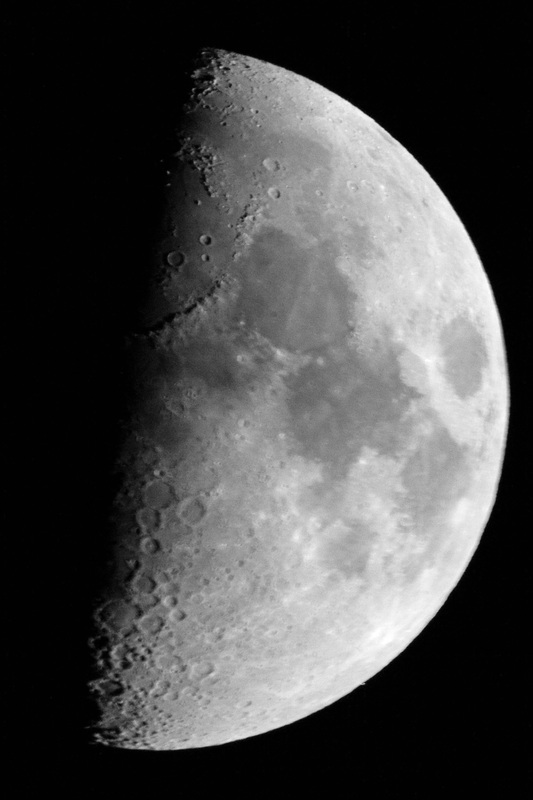 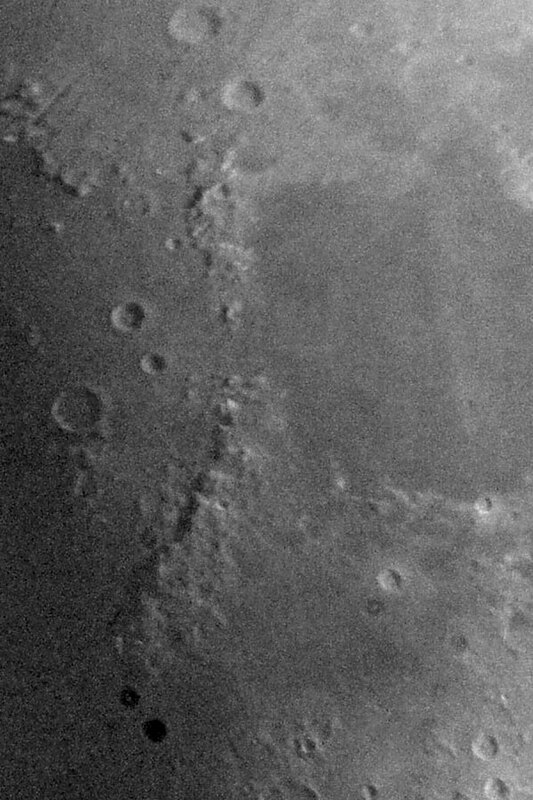 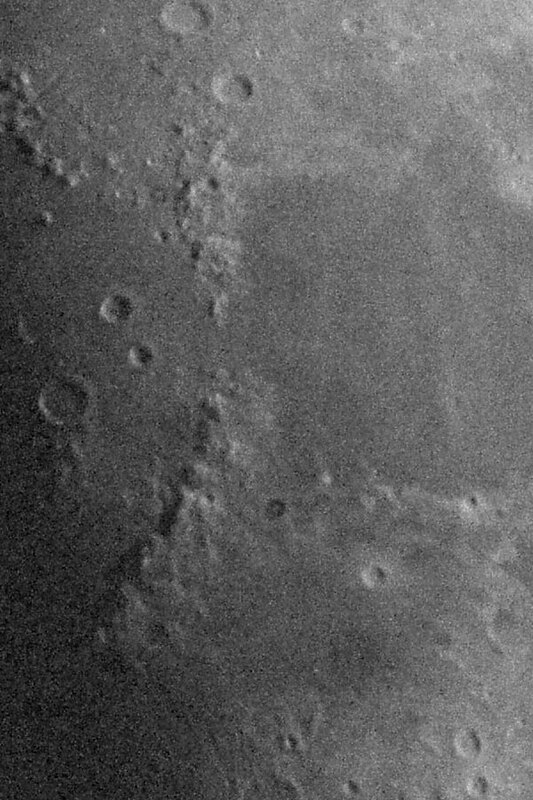 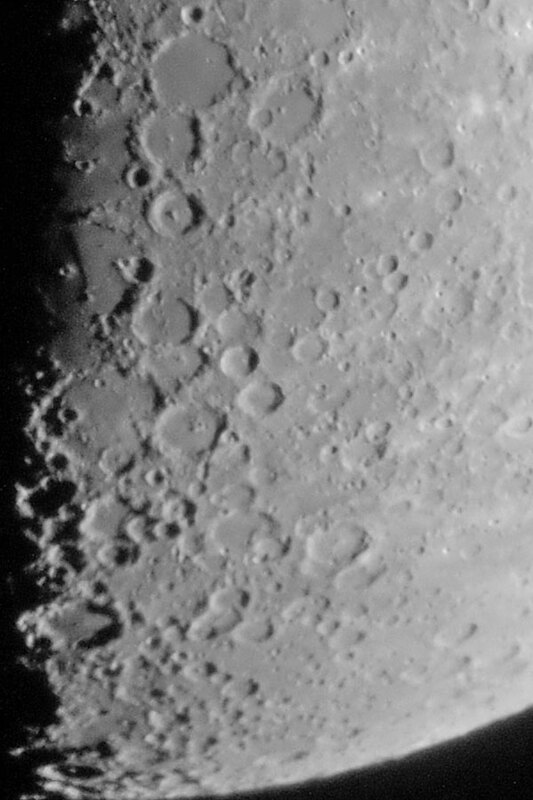 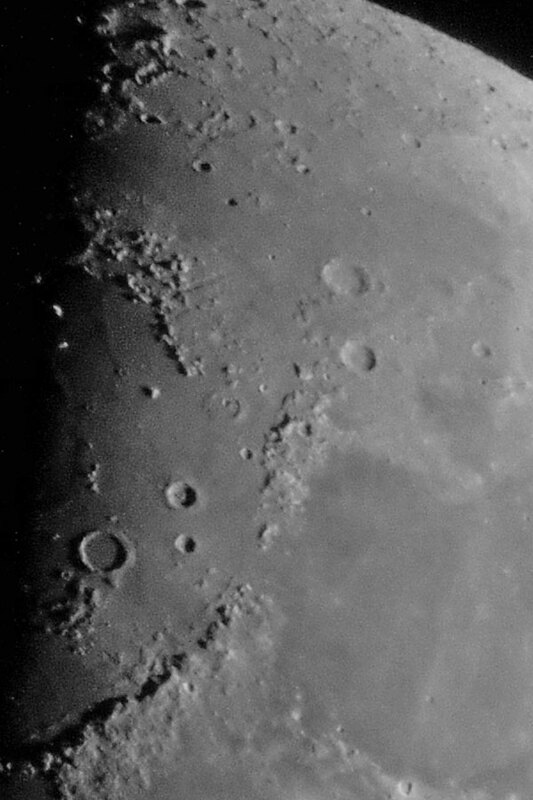 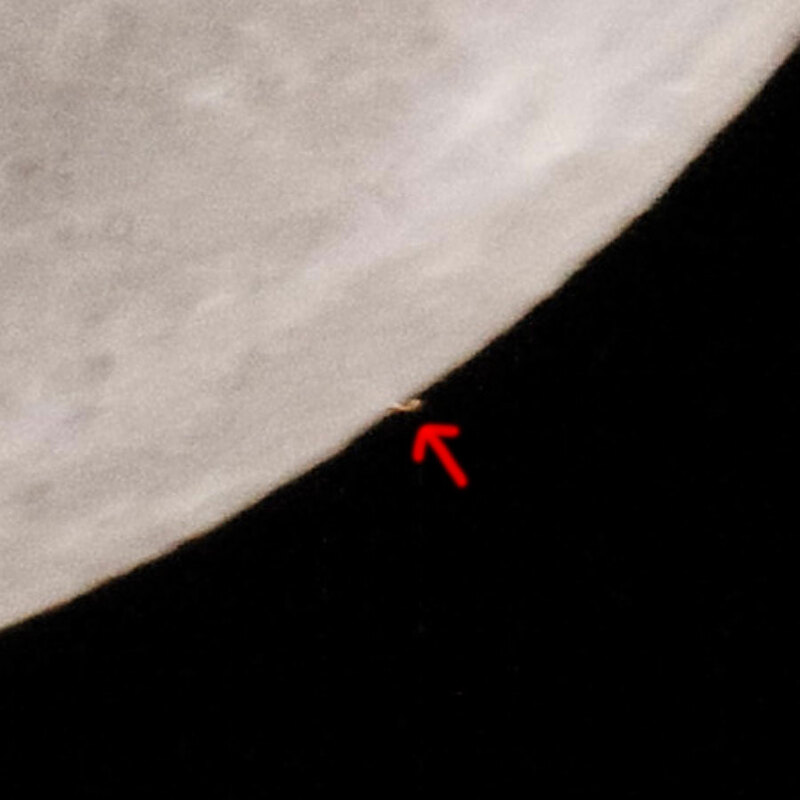 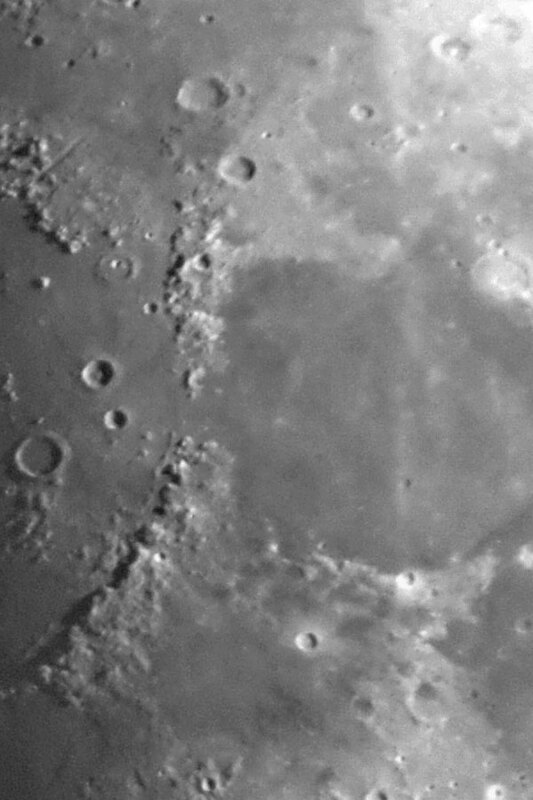 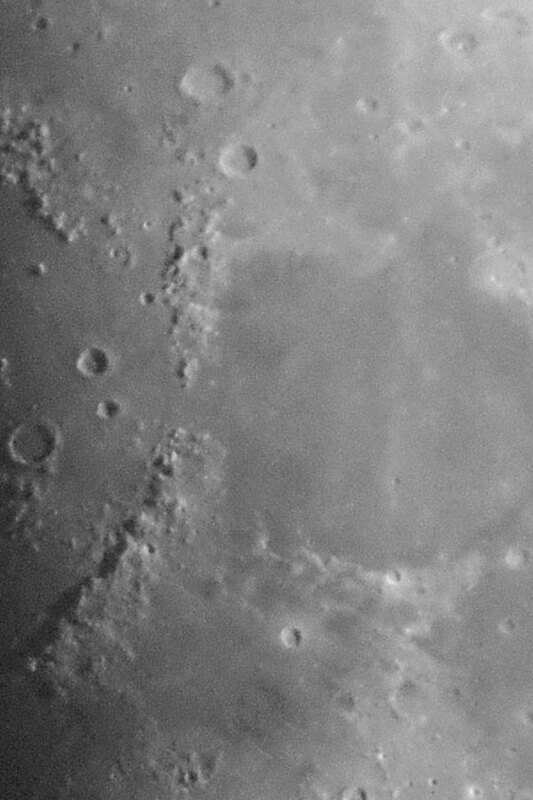 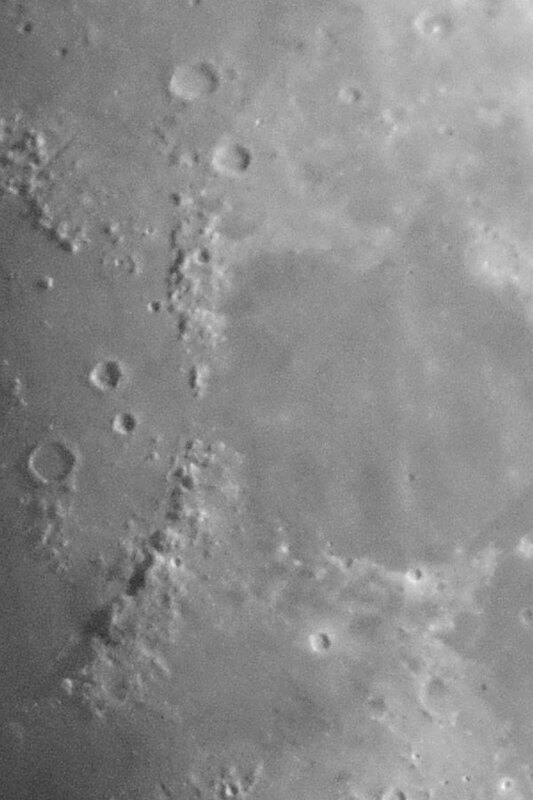 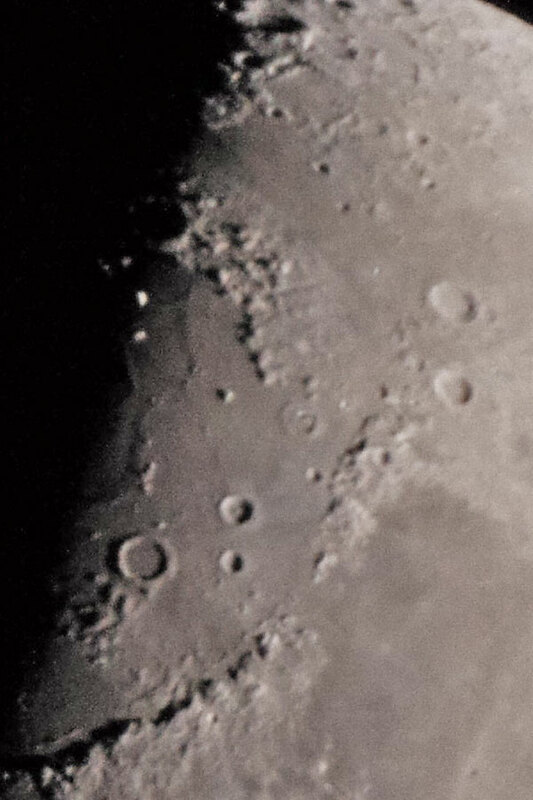 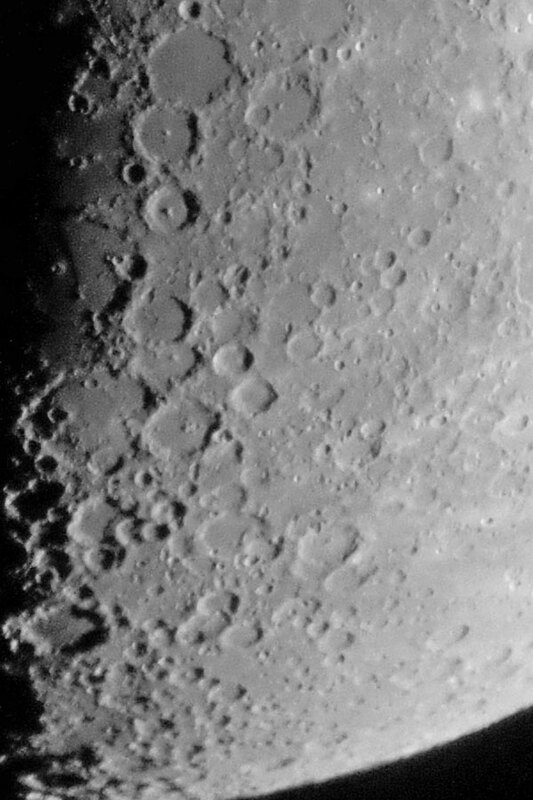 Nevertheless, the Skymax-127 seemed the better choice for my upcoming photos of the Aldebaran covering by the moon. 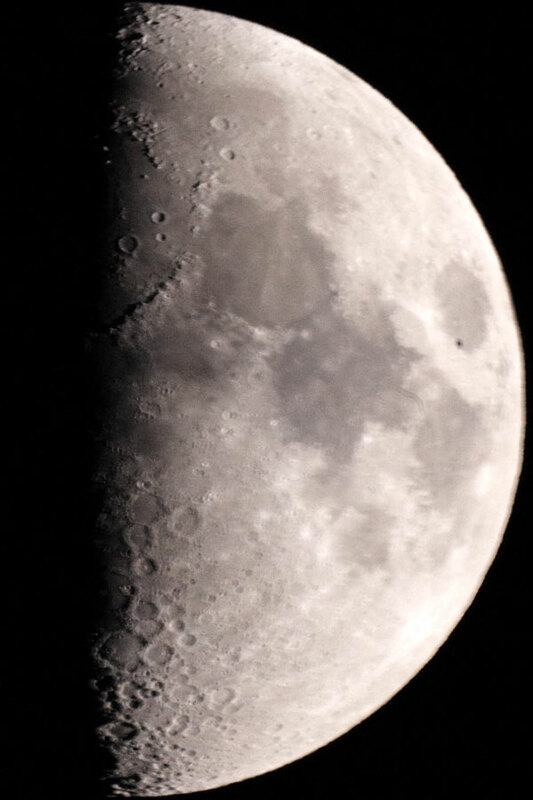 I wanted to use the Skymax-127 with the Leica M (type 240) to photograph the covering of Aldebaran by the moon. 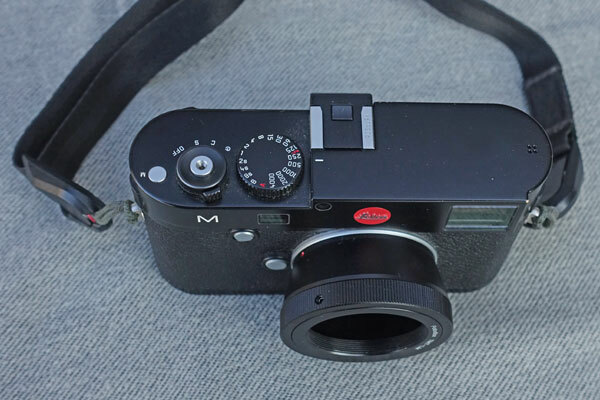 This should also serve as a test for the direct use of the Leica M on the Skymax-127. 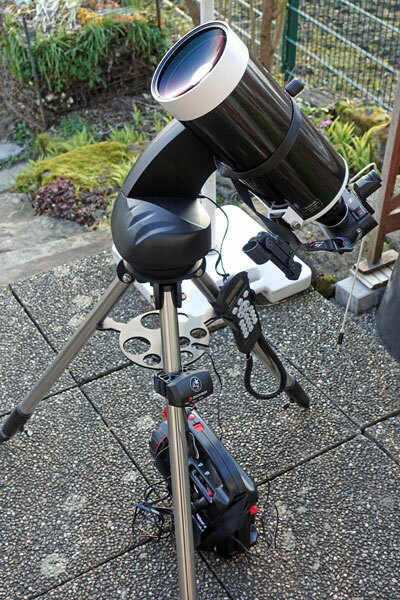 Furthermore, I had built up my Skymax-102 tube for my wife for observing the covering of Aldebaran. 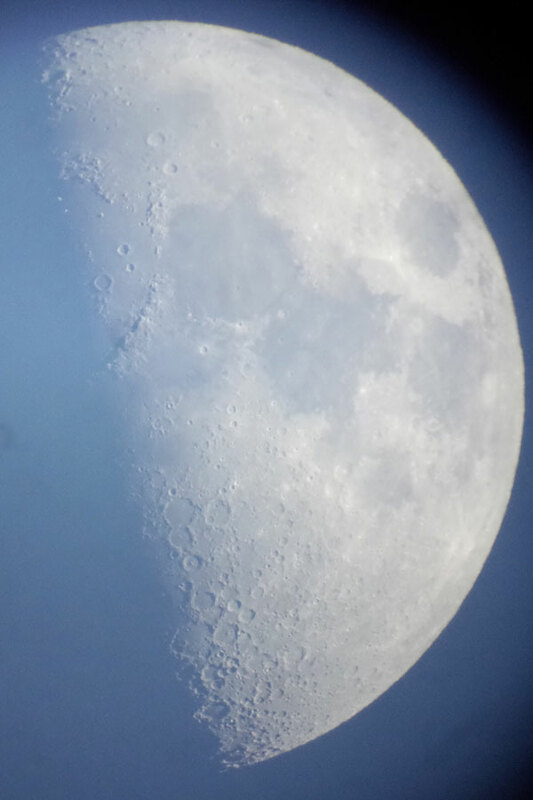 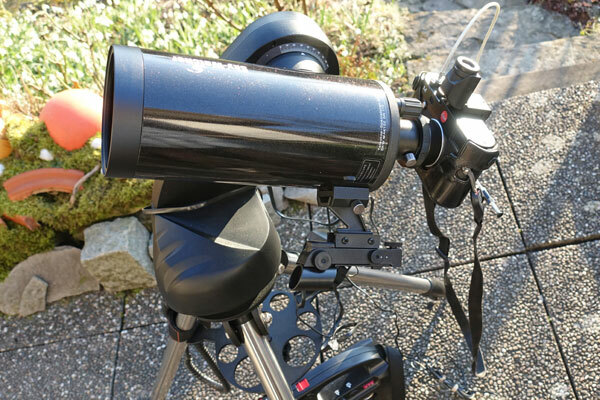 Luckily, I took occasionally photos with this telescope and the Ricoh GR using the 1:50 method. 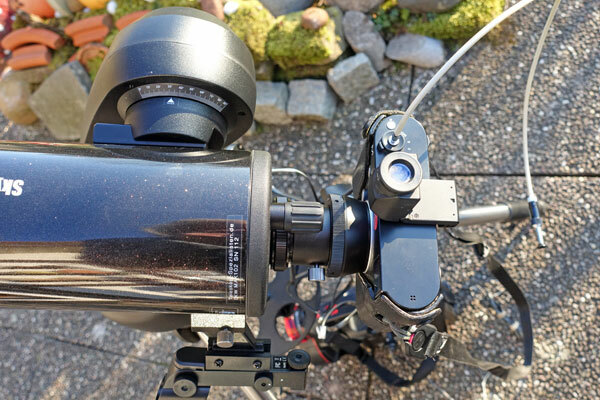 Without this second camera I would not have achieved sharp photos of the Aldebaran covering! Before the covering of Aldebaran (at about 17:50) the sky was still quite bright, and Aldebaran could only be seen in binoculars or with a telescope. When it returned one hour later (18:50 o' clock) on the other side of the moon, the sky was already quite dark. I also took some photos during the covering, when the sky was already a little darker, and the photos therefore showed more contrast. 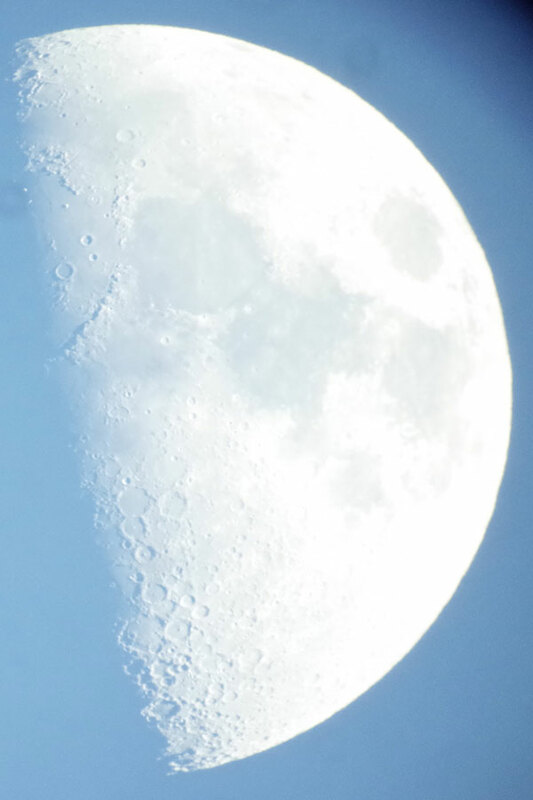 Especially the photos before Aldebaran's disappearance are dull and lack contrast. They also clearly show that the sensor was very dirty. 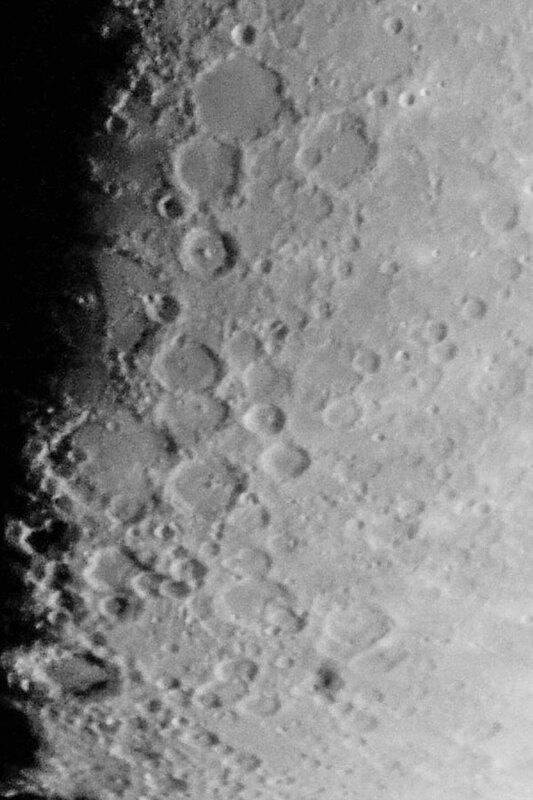 In these tests, this did not really matter, but if you want to take serious astro photos, you should clean the sensor thoroughly first. 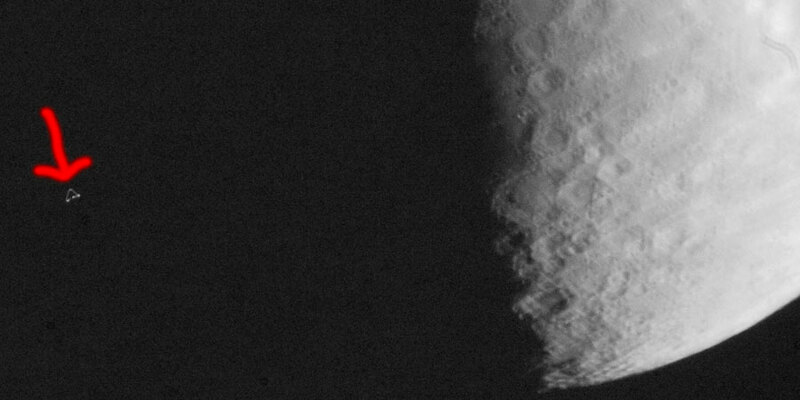 On the later, darker images, the sensor dust is no longer that noticeable. 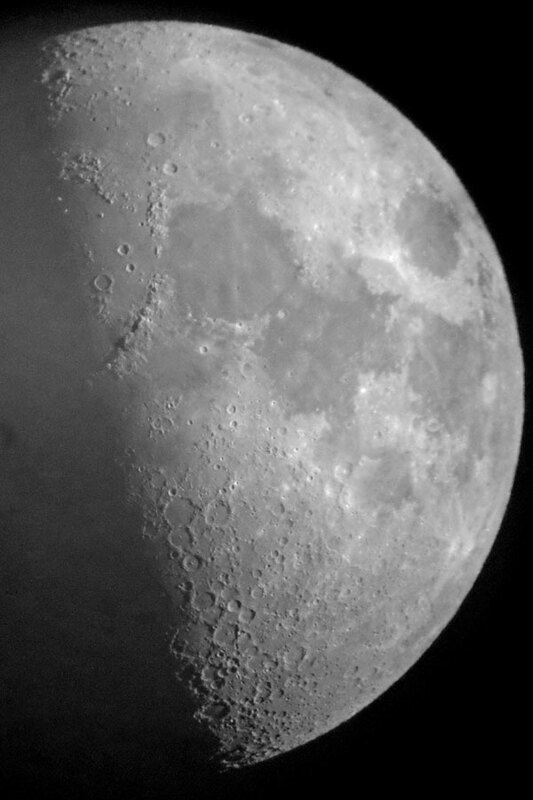 In this phase, I took about 40 photos. 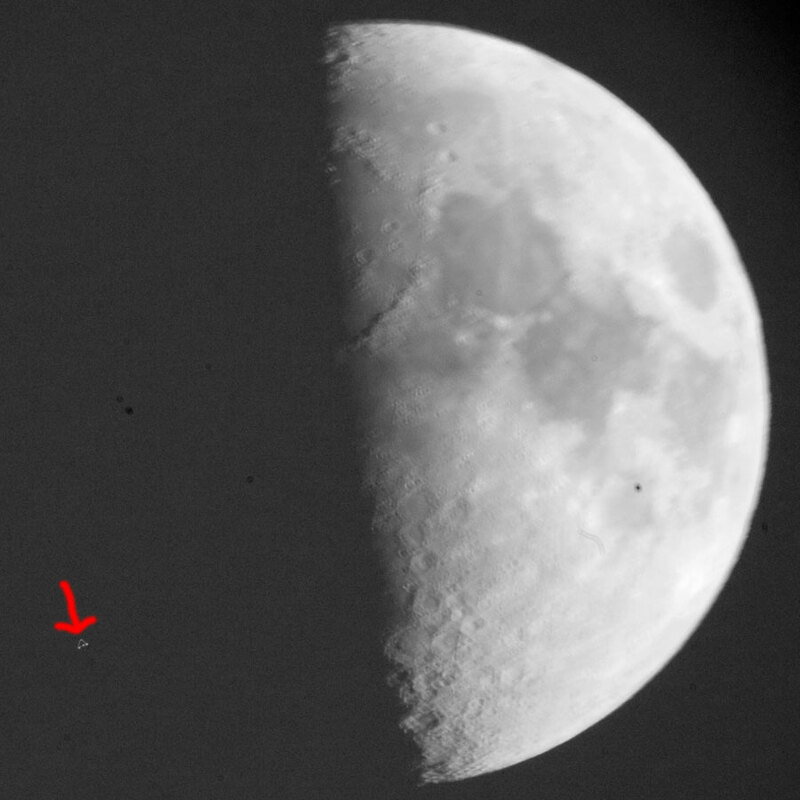 I took the first and early photos to try out the equipment, and then (from the 15th photo on) to document the coverage of Aldebaran. None of these photos were really sharp, although the exposure time was usually 1/500 sec at the beginning, in exceptional cases even up to 1/1000 sec. 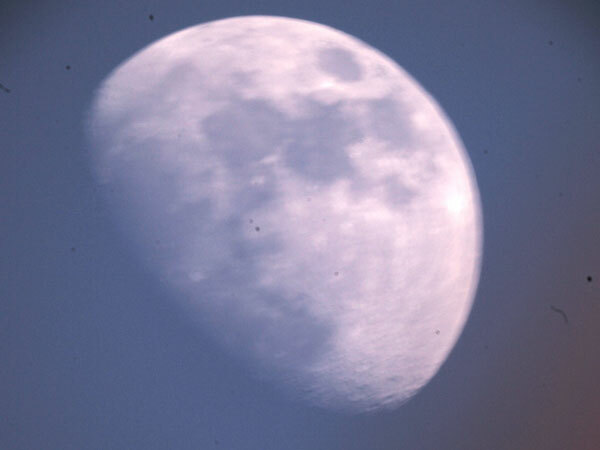 Towards the end, shortly before 6 p. m., the exposure times went up to 1/250 and 1/125 - with the result that the photos became increasingly blurred (usually having double contours). Since the sky was still very bright, the contrast was low, so that the quality of the photos is not sufficient for this reason. 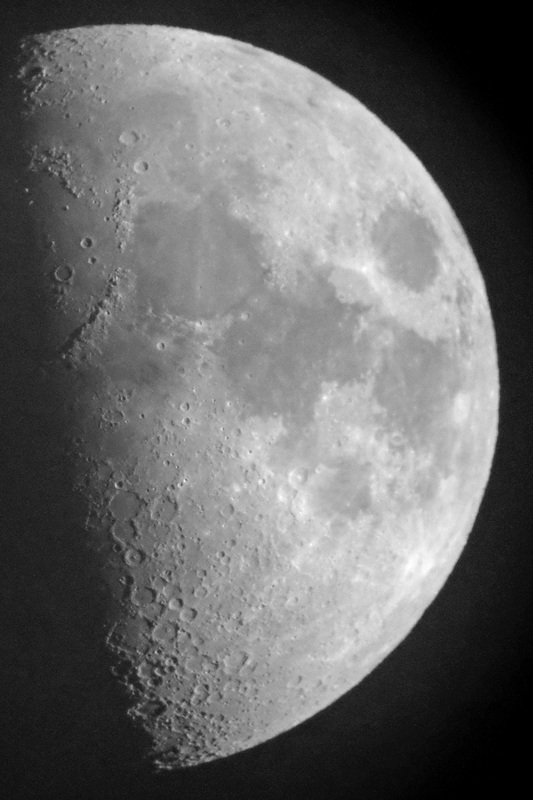 When I increased the contrast, I got a lot of noise (ISO 1600). 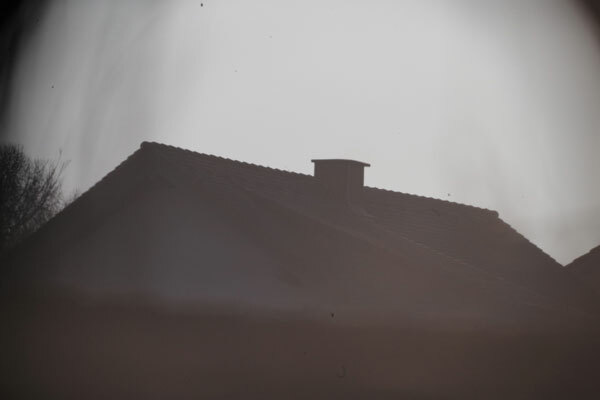 In addition and as already mentioned above, dust on the sensor disturbed the photos. Here are three relatively sharp variations from the initial phase (16:49 to 17:10 o'clock). 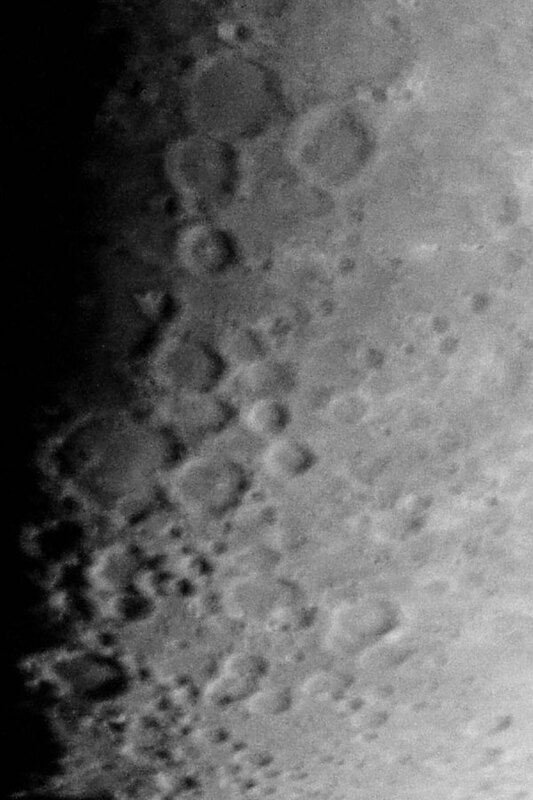 The noise becomes more obvious when you look at the larger versions. 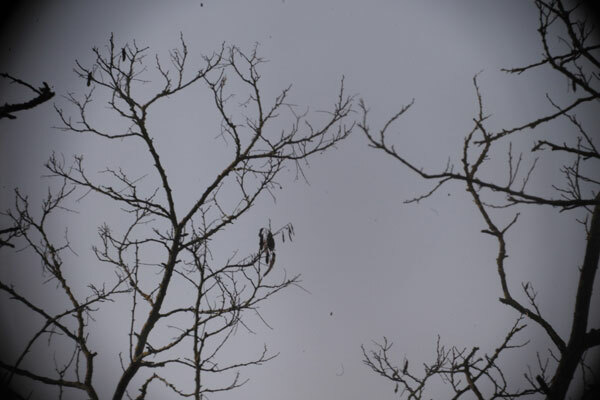 Here I present four typical samples of the 6 photos that I took in this phase. The sharp sample might be the only really sharp photo of the whole evening, probably because it was more underexposed and therefore had a shorter exposure time (1/1500 sec). 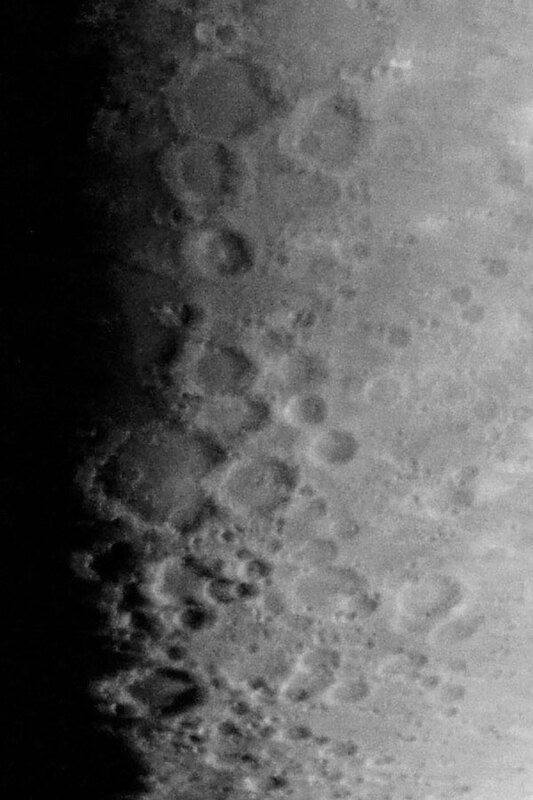 Most of the photos resemble the two fuzzy samples, some of them have double contours at the bottom, but not at the top (see the photos of the bottom row). 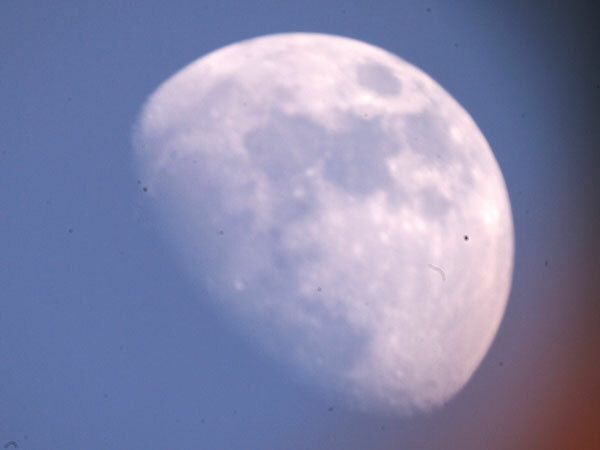 This may be a hint of camera vibrations that, despite exposure times between 1/250 and 1/500 seconds, led to blurring. 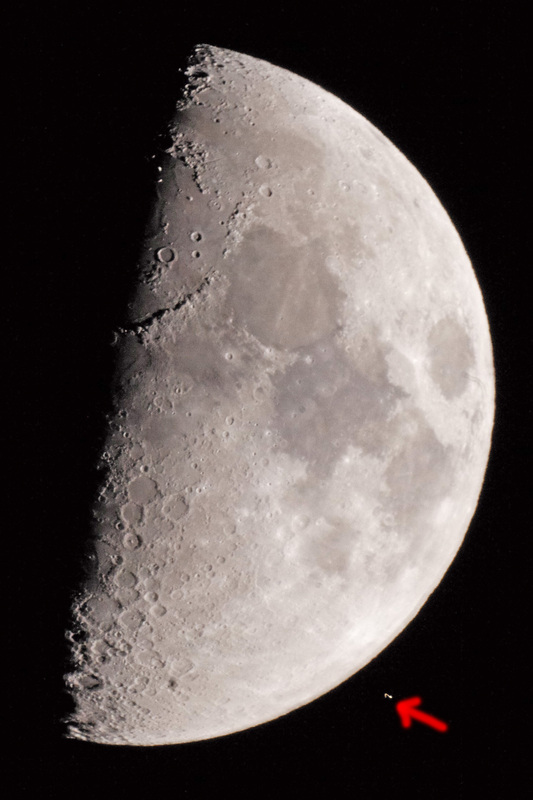 From this phase on, I increased ISO from 1600 to 3200 to get shorter exposure times. 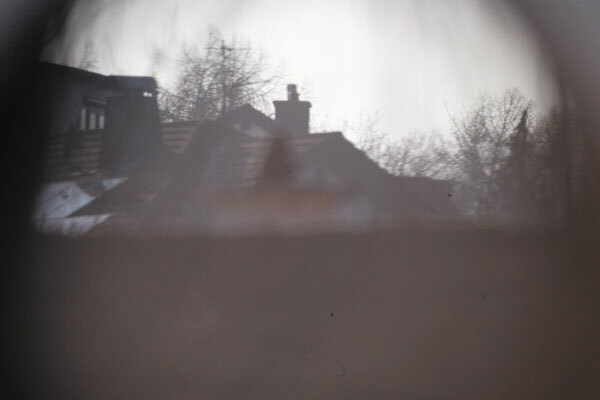 The few sharper photos might be a bit deceptive about the fact that most of the photos were blurred. With stronger moonlight and therefore higher contrast, however, the noise remains within tolerable limits. 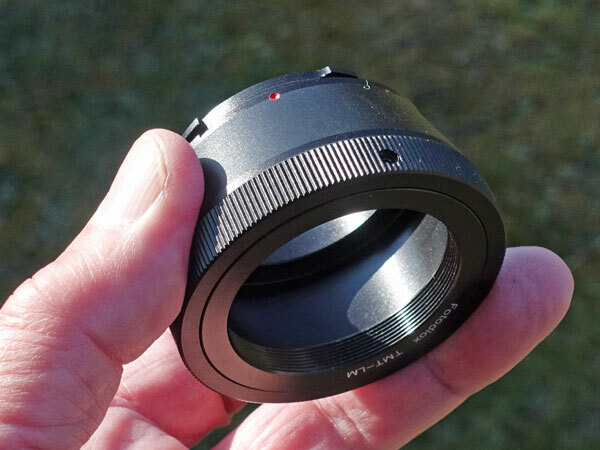 So the question remains, how to prevent camera shake effectively? 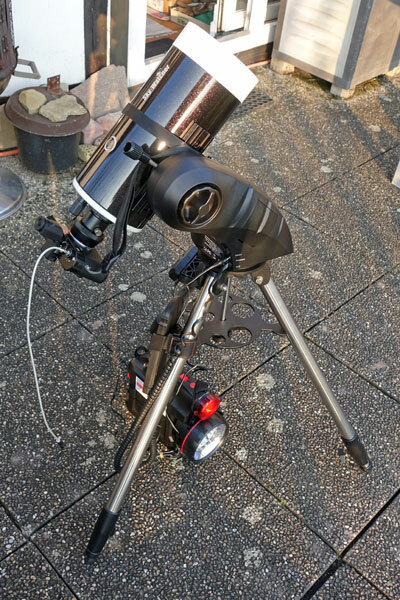 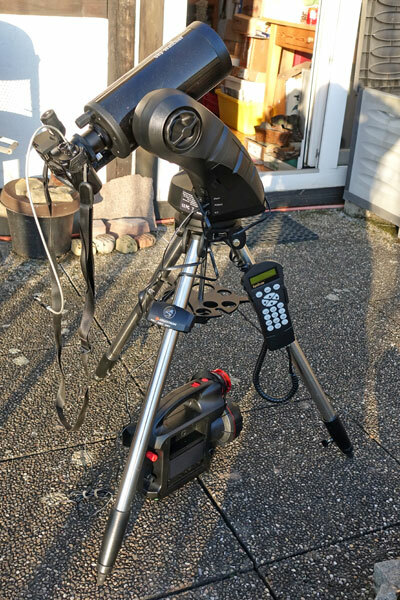 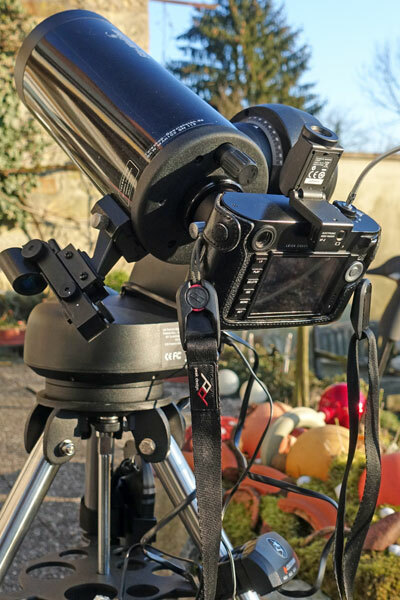 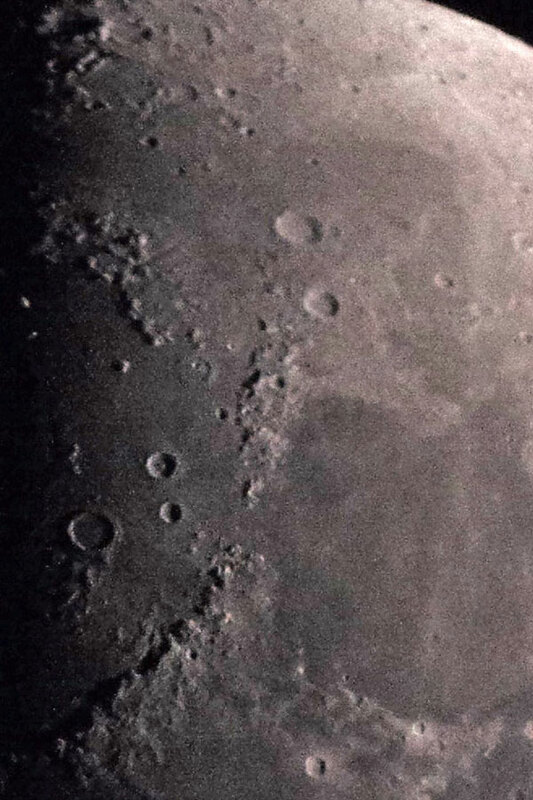 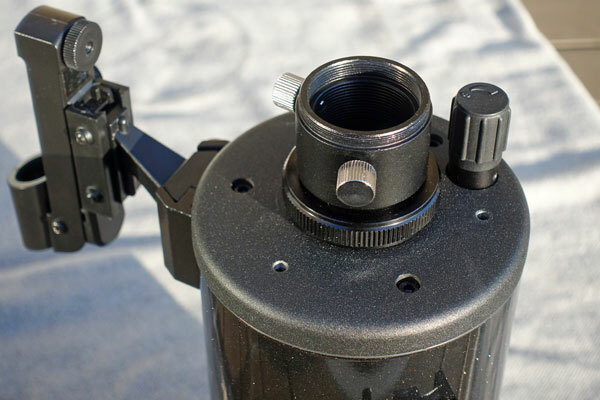 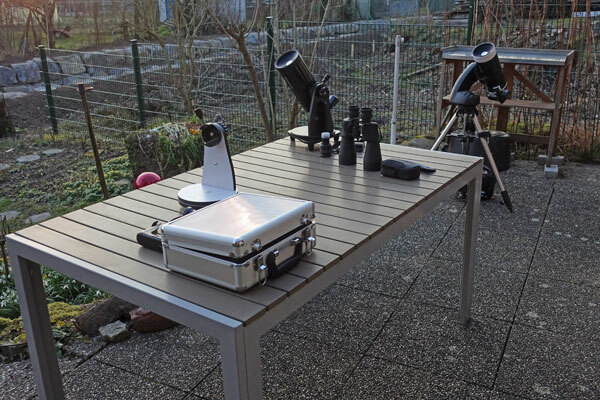 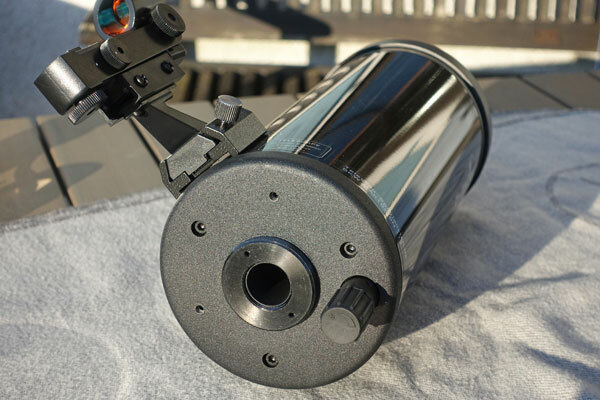 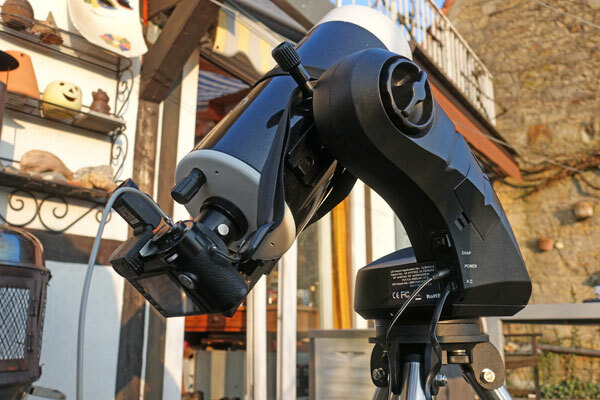 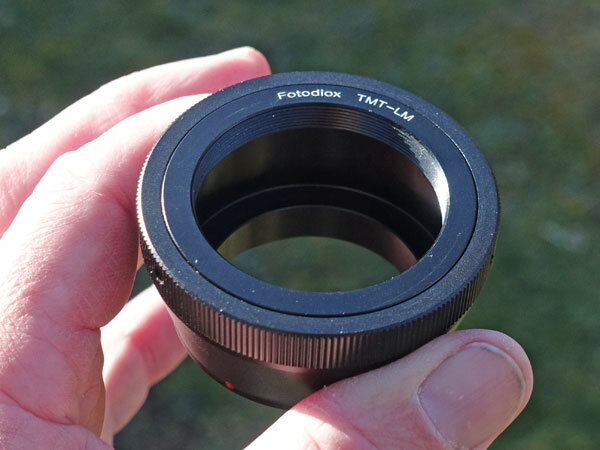 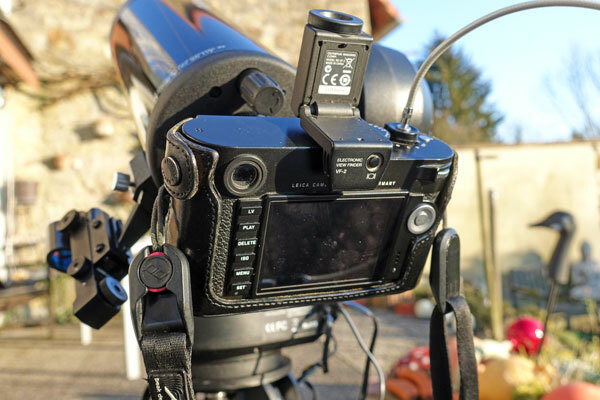 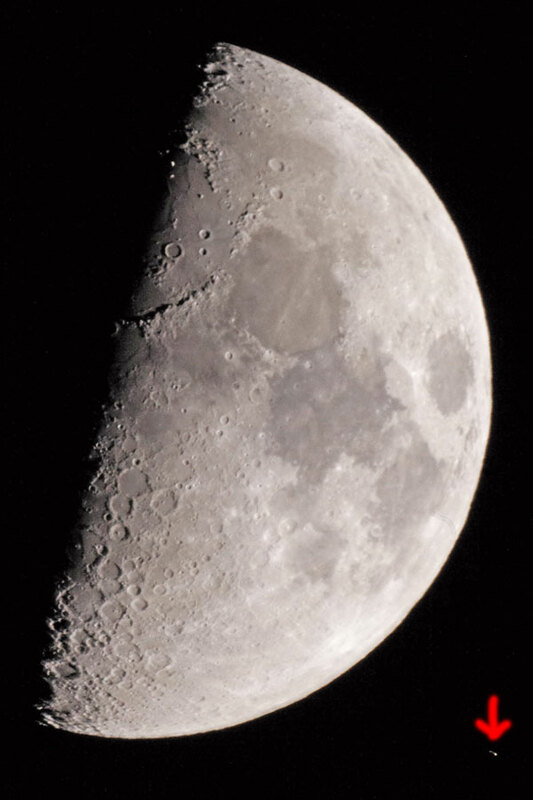 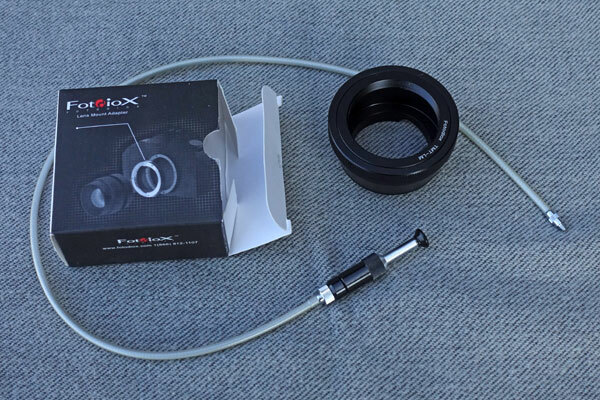 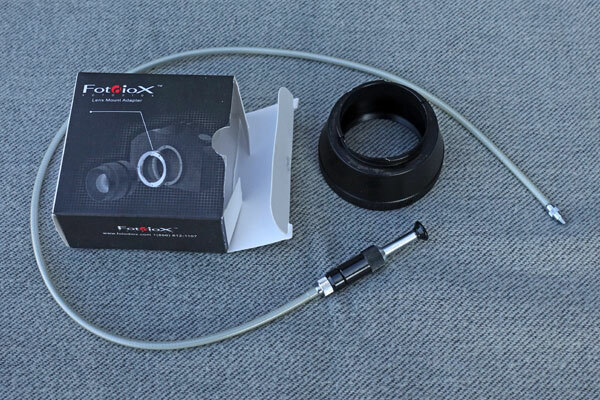 The main purpose of this page is to show how to connect a camera with interchangeable lenses to a telescope with a T-mount option. 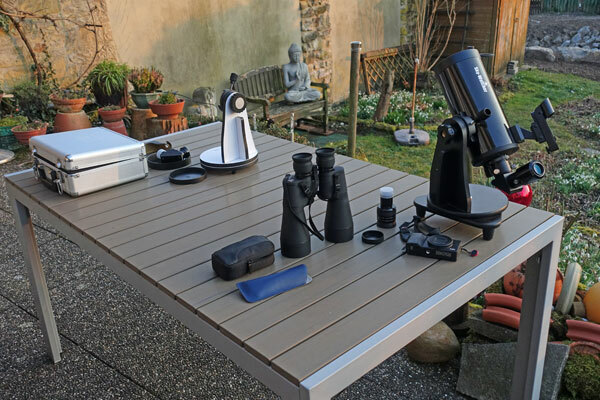 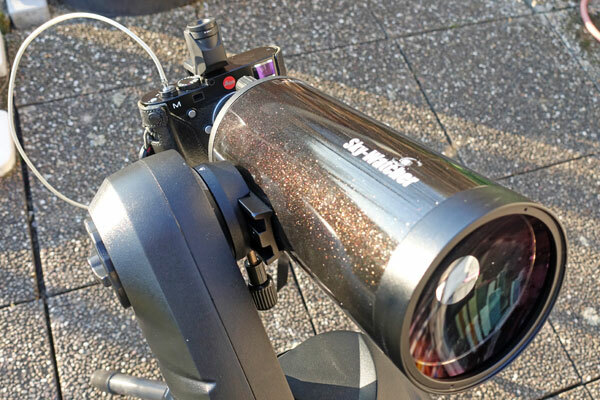 This is shown for the Sky-Watcher Skymax-127 and for the Skymax-102. 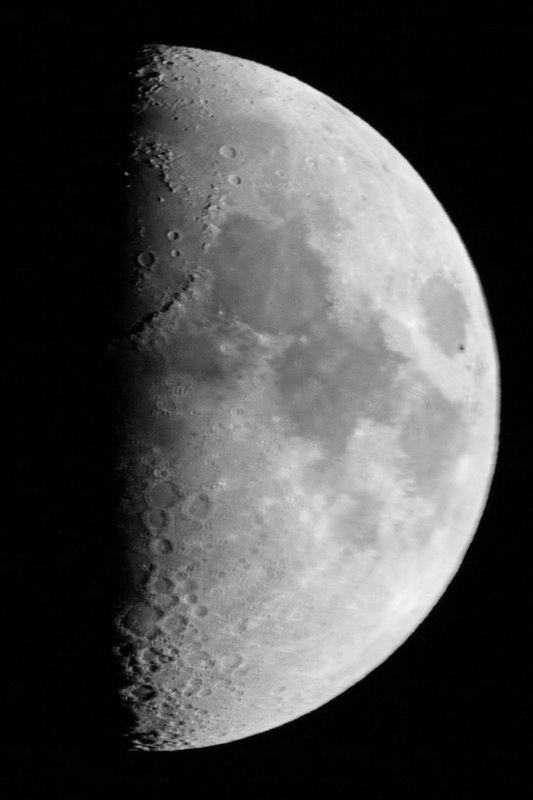 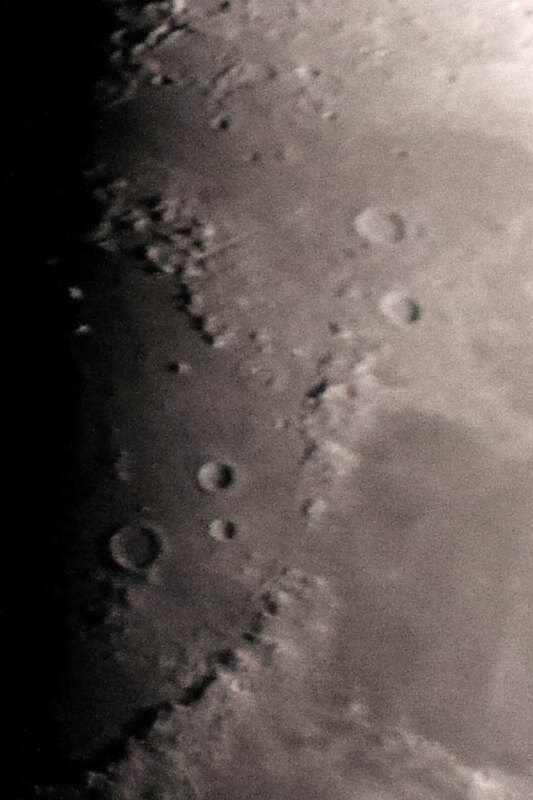 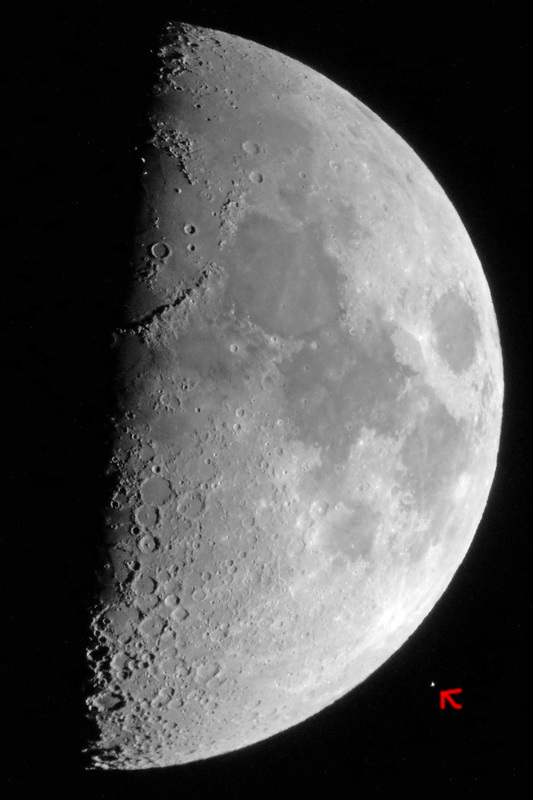 However, the results that I achieved with the Leica M (type 240) at both telescopes do not meet my expectations. 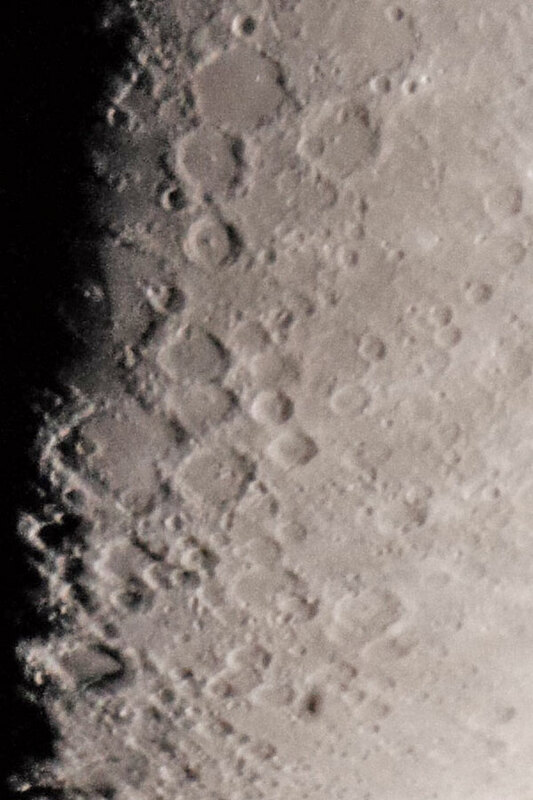 On the one hand, the noise behaviour of the camera seems to be partly poor, which I had not noticed before. 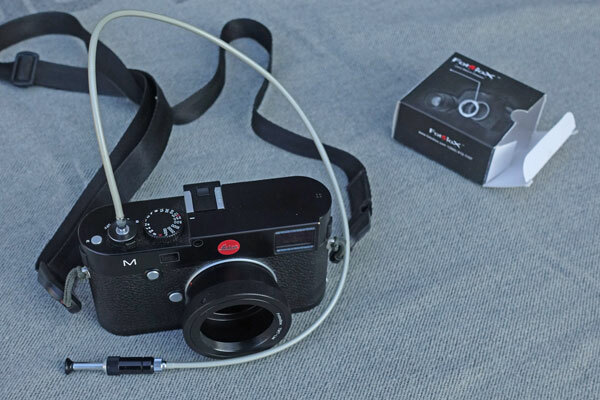 The noise in the first few photos is not acceptable, whereas on the later photos taken in bright moonlight, the results seem to be acceptable, but the Ricoh GR is also in this situation still better (see Appendix). 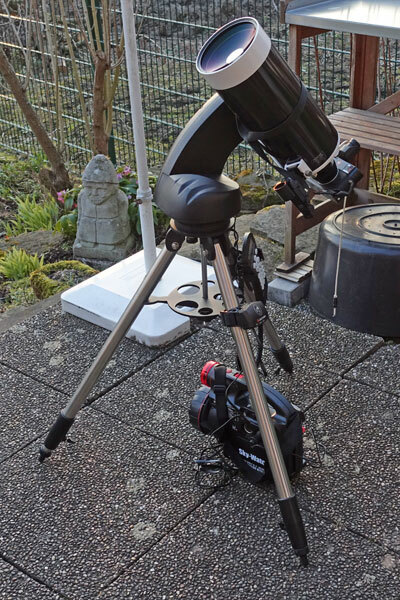 In parallel to the Skymax-127 with Leica M, I had built up the Skymax-102, through which my wife observed the Aldebaran covering. 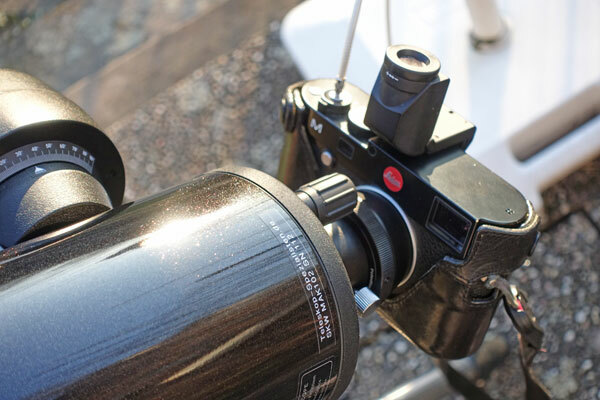 At this telescope, I took some photos with the Ricoh GR using the 1:50 method. 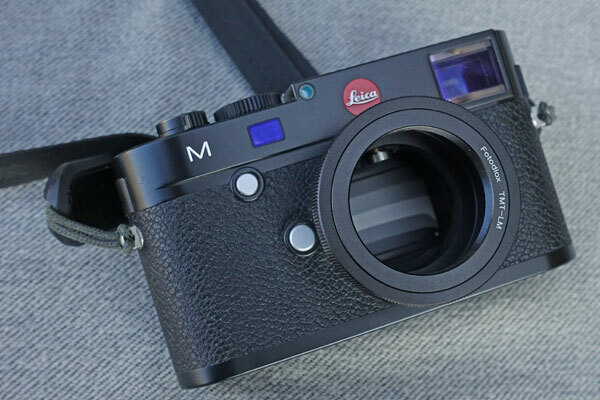 In the following, I would like to present some comparison photos of the Leica M and the Ricoh GR. 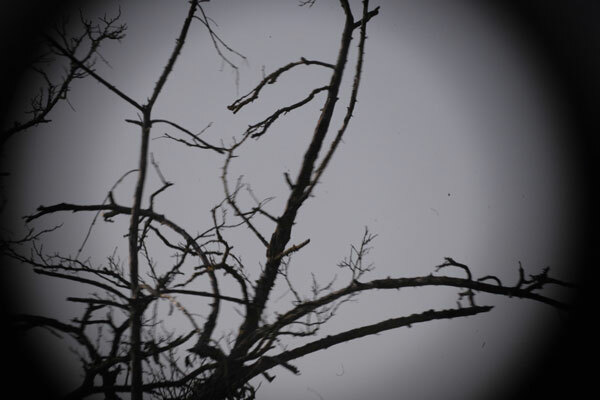 I start with photos from the time when the sky was still relatively bright. 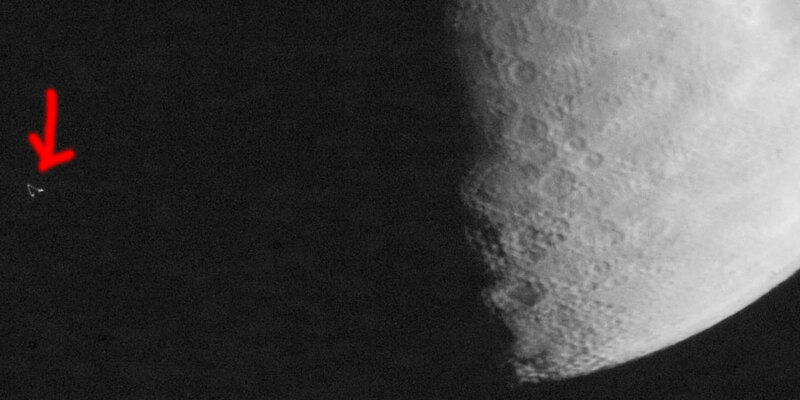 The noise differences between the two cameras seem to be most obvious here. 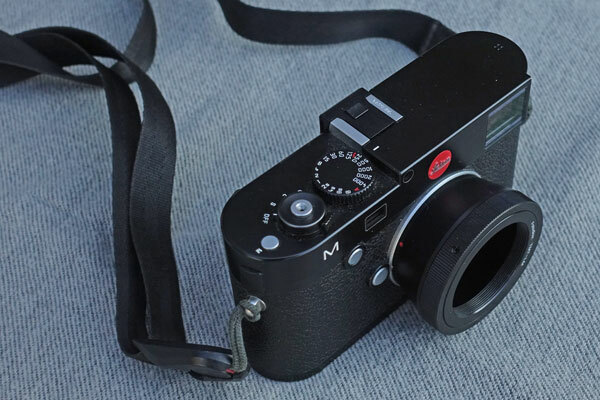 To make it short: On small samples, the Leica M photos look almost better than those of the Ricoh GR, but if you look closer and magnify them, there is a huge difference in the noise behavior of both cameras: the Ricoh GR is much, much better in this situation than the Leica M.
Once again, the Ricoh GR shows a better noise behaviour than the Leica M, although perhaps not as clearly as for less light.